The average American taxpayer has quite a few options when it comes to preparing a tax return. Those with a modest income, employees, tenants, and low investment owners are better off filing their taxes online through tax preparation websites. The online services are quick, inexpensive, and offer a convenient solution for your basic tax needs. Certain brick and mortar tax preparing services have now launched their own websites for such clients. However, not all tax situations are similar. 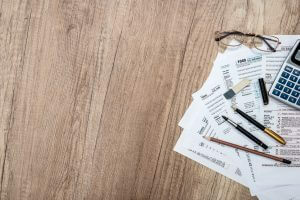 If you own rental properties, run a business, or have other investments, preparing a tax return is a lot different and, in many cases, will require the services of an expert. A professional tax preparer will ensure that your deductions are maximized and you end up with a significantly lesser tax burden. However, even an expert requires tidy bookkeeping and certain items to help you file a return to the best of their ability. You are required to have a photo identification that would appear on top of the form 1040. Any type of identification document is sufficient to go through this step. A social security card is the most important identification document when preparing a tax return. If you have a spouse or family and are planning to file jointly, everyone’s social security cards are required. Married individuals need the signature of their spouse on their tax returns before they are submitted to the IRS. For US citizens, a social security number works just fine. However, in some cases, other nationality holders are required to file income tax returns. They need to acquire an ITIN (individual taxpayer identification number) and bring that to the tax preparer’s office so that the process can proceed. The purpose of income tax is not only to inquire about what you earn at your place of employment, but income from other sources as well such as investments, businesses, the sale of property, etc. Not all of your income is taxed at the same rate and some won’t be taxed at all. However, you have to disclose everything. Earned income will be taxed separately from unearned income. You must have an official income statement from each of your income sources. Your employer reports your earned income as a W-2, while self-employed individuals report it as a 1099-MISC. You must bring all of these income documents to the expert’s office to prepare your tax return. Below are some types of incomes that you should report to the IRS. Once you have acquired everything that is needed, you can proceed with the deductions and exemptions. The most vital reason for hiring a tax expert is to increase your deductions in compliance with the rules and regulations of the IRS. All taxpayers are permitted for a standardized deduction. However, if you really want to reduce the tax burden, there is a lot that can be achieved by providing substantial documentation of your expenses when preparing your return. This is why it is important for you to always keep receipts as they are the sole proof of your expenses. Businesses are often liable to the most amount of deductions in the form of business expenses. Though, there are deductions like medical bills, childcare expenses, mortgage interest, and charitable contributions that can be included in individual expenses. If someone has encountered an unexpected situation and suffered heavy losses, you must not think that the IRS is going to get you. Several provisions in the tax code are designed to help such individuals and businesses who have incurred heavy damages. To claim a loss or theft, you will have to provide a proof of ownership as well as the details of how it was taken away from you. If you have claimed part of the damages with your insurance, that must be clearly stated. In the majority of cases, victims of natural disasters are totally exempt from taxes by providing a proof of lost property and rebuilding expenses. Individuals who are able to produce all of the above-mentioned items have no need to worry when it comes to preparing a tax return. You just need to find a good tax preparer and get this taken care of before the due date with solid deductions.